When I posted my last blog, I received many comments through Facebook, email, and this blog assuring me that prayers were going up for Billy and all of us who care for him. I posted on February 27th, and God answered my prayers on February 28th. When I went to feed Billy the evening of the 28th, he was a different person. He was responsive and smiled easily, and he told me he loved me. What a huge blessing! The next evening was even better. I spoke with the evening nurse who told me they increased his Seroquel and changed the Xanax to prn. He always seems to "need" it more on the weekends. I'm not certain if his behavior is off on the weekends or if the expectations are different. I was able to pick him yesterday afternoon and take him to our Saturday evening service at church. It went well, and for the first time since the holidays, I took him home for a few hours for dinner and time with family. 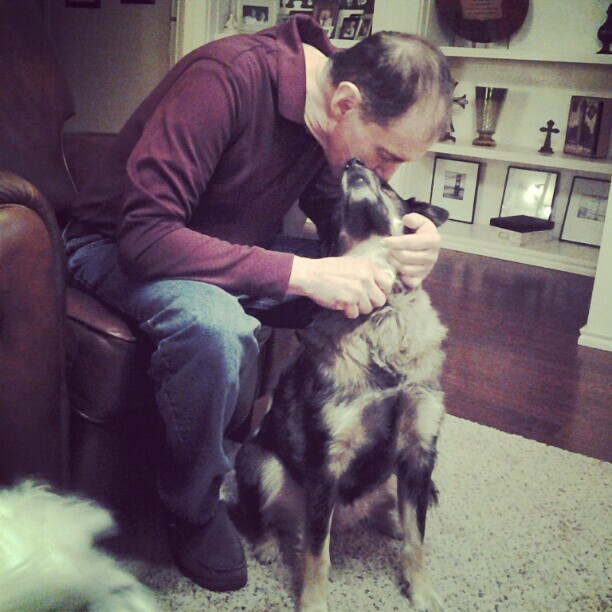 He was in a great mood, and as soon as he walked in, he began petting his dog, Bailey, and said, "There she is!" I love this photo that my son-in-law, Andrew took. He loves his dog! I never doubt that God hears our prayers and answers them, but I don't always get his answer so quickly. Praise Jesus for interceding and putting my mind at ease. I am not naive about Alzheimer's Disease, and I know the future for Billy unless God provides a miracle, but oh how relieved I am that I am not facing a more declined mental state at this time. I am always so grateful for your prayers.